“Here’s my card. Call me.” No, I’m not talking about a new fool-proof pickup line. I’m talking about a networking strategy that has stood the test of time, namely, handing out business cards. Though I have read no shortage of articles written by self-proclaimed gurus who think the day of paper business cards has come and gone, I always finish such articles thinking that these folks need to open their eyes. When is the last time you went a week without seeing someone’s business card? They’re everywhere! In fact, according to published statistics, we print about 10 billion of these cards every single year in the U.S. alone. Granted, there are more ways to share our information with others today than ever before. Phones and email and Social Media allow us to connect almost instantly and learn a lot (maybe too much) in a few clicks. Nevertheless, the stand-by, tried-and-true method of handing someone your contact information on a business card is alive and well. They are small (and therefore portable), but still big enough to provide all the important information, and much more efficient than writing our information on the back of a napkin. They are even, arguably, faster than standing and typing the information into our smartphone – and with the right app can actually be photographed and stored on our phones if you like. But sadly most pharmacists (and other professionals for that matter) don’t have their OWN business cards. Maybe (just maybe) you have a company-issued business card. But in my opinion that is not enough. It’s fine for promoting yourself in connection with THAT business, but for the advancement of your career and for networking you really ought to have your own, personal and professional business card printed. 1) A personal, professional business card demonstrates that YOU are a business and a professional. You are. And companies may want to contact you personally, not through your company-issued email address or work phone. 2) A personal, professional business card is the fastest way to put your most important contact information into someone else’s hand. Sure, you could scribble down your phone number on that scrap of paper or napkin. But really, is that how you want to present yourself? A business card gives someone everything they need to know in order to follow up with you at a later time. 3) A personal, professional business card communicates certain valuable characteristics about you which are very attractive to potential employers or business partners. It means you are organized (you found your card right? ), that you plan ahead (you carried it with you! ), and that you are approachable (the card is a printed version of: HEY – GIVE ME A CALL!). 4) A personal, professional business card allows you some room for personal expression. Though getting TOO creative might not be a good idea, a business card can offer you the chance to work with a designer to let your personality slip through without being too distracting. Your best email. Ideally an email address that won’t change if you happen to change employers or internet service providers (e.g. a gmail or yahoo account are a good idea). Do NOT use your current employer-provided email. Your phone number, ideally your mobile phone. If you think there is a good chance you will be changing your mobile number soon, then use your home phone. Of course, do not use your current “work” phone or office number. Address: Should you put your home address on your business card? My question is this: Are you inviting your contacts to your home? My guess is no. So leave it off. If, however, you happen to have an off-site office that you use, feel free to include that. A PO Box is acceptable too, if you have one. FAX: Do you have a dedicated FAX number? This can be useful, but isn’t absolutely necessary. Business cards are primarily helping to make an initial or follow-up contact with someone. If you get to the point of needing to fax things to each other, you can disclose such information via phone or email. Experience/Qualifications: A brief list of your most important accomplishments or qualifications is a helpful way to remind a contact about who you are and what you can do. Keeping these brief and focused is important. An alternative to this is sometimes to include a famous quote from a successful business personality or author. Make it something you embrace and believe as well. 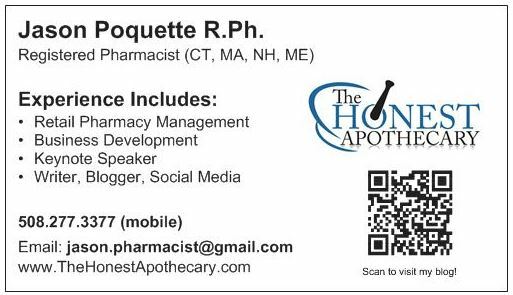 An Image/Logo/QR Code: For those in the field of pharmacy, there is nothing wrong with using some sort of well-recognized pharmacy image (e.g. a mortar and pestle) to add a little diversity to your professional card. Also, if you have your resume posted online, a blog or a LinkedIn profile, you can even add a QR code which, when scanned, will bring your contact directly to your site. Pharmacy CE events – Have them handy whenever you go to a live CE. You never know who you might run into. Professional Organization Meetings – Do you attend any meetings sponsored by pharmacy organizations? Bring your card and hand them out. Business Owners – Is there a business, pharmacy or organization you would LIKE to be connected with in some way? Stop by. Talk to someone. Leave a card. Mail – If you write someone a letter, related to your professional interests, include a business card in the envelope. Holidays are a great time to reach out to contacts with a greeting, and you can easily include your business card if you have one. Community – Have you stopped by and introduced yourself to someone at the local senior center? Could you offer to come and give a brief, free talk on medication management? How about meeting with the director of a local assisted living or senior housing complex? Leave a card. Could you offer to speak at the local high school on a health topic related to pharmacy? Give it a shot. Leave a card. Patient questions – Ever been asked by someone to answer a pharmacy-related question? Sometimes it is easier to hand them a business card and ask them to email you some more details or to set up a time to talk later. Having a business card handy makes this easier. Ordering your own business card is easy. Companies like VistaPrint offer affordable, online platforms to design and print your business card from the comfort of your home. You can probably get 500 made for less than $40 or so. Don’t skimp on the paper quality. Pay a little bit extra and get a slightly firmer card stock. You can also opt for other little extras like raised print. Leave the backside blank (or at least have some space for writing). Writing something on the back of the card makes it statistically more likely that the person will hold onto it. With that in mind, avoid the glossy finish on your business cards as this may make it harder to write something on them. Get a case. It makes no sense to order business cards and not have some method for carrying them. THIS case from Amazon is only $9.99 and should do just fine.